Winnie the Pooh is a yellow teddy bear with embroidered brown eyes and a brown nose. 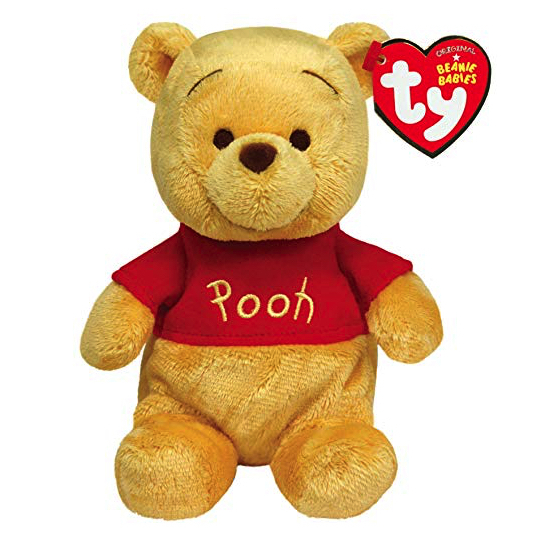 He wears a bright red t-shirt with the word “Pooh” embroidered on the front in yellow thread. Winnie the Pooh was released on 1st January 2013. He doesn’t have a Birthday, and the inside of his swing tag doesn’t have a poem, only his name. Winnie the Pooh is based on the A.A.Milne character of the same name. This Beanie Baby version is modelled after the Disney version of Winnie the Pooh. There are two other versions of Winnie the Pooh. A Disney Sparkle version that wears a sparkly t-shirt and a Christmas version. He was retired on 29th January 2016.